BE WISE: ON WHAT ARE YOU BASING YOUR WORTH? ON WHAT ARE YOU BASING YOUR WORTH? If you have an Instagram account and have used it within the last month or so then you are aware of the changes they have been making. At first when I realized that any “spammy” accounts would be removed I thought it was great. However when I noticed my precious 2,500+ followers had reduced to an “embarrassing” 1,996, I was a little less than thrilled. In fact, I am not proud to say it, but I was bugged. The more I thought about it the more I wasn’t sure if I was actually bugged by my loss of followers or if I was bugged that I was bugged by my loss of followers. Starting BE WISE Magazine truly has been a very interesting business adventure. Something that I know little to nothing about. But one thing I do know, (or have come to know) is that people really care about your “following”. I have been asked a billion times how many “followers” or “subscribers” I have. Sometimes I hesitate to give them the numbers. I mean, there are plenty of people who have outstandingly higher numbers of followers than I do. Why would someone want to collaborate with a regular girl from Utah with a less than impressive social media presence? Then it hit me. I have been falling into the same trap that I specifically started BE WISE to keep people from falling into. I have been basing my worth on a number. A number of people who, let’s be honest, I probably don’t even know. I might not have a huge social media following. And guess what, that is ok. Over the space of two years since I started BE WISE I have received a substantial amount of emails or comments from people who have voiced that BE WISE had in some way affected their life for good. If I have helped even one person, then in my mind, I have been a success. I understand that by the world’s standards I might not be, and I have even had “prominent” people opt out of being in my magazine based on my “lack” of followers. While at times that has been frustrating, and even hurt, I know that what I am doing is of worth. When I came across the quote, “Just because someone has more followers than you it does not make them better than you. Hitler had millions. Jesus had 12,” it really put things into perspective for me. Now don’t get me wrong. 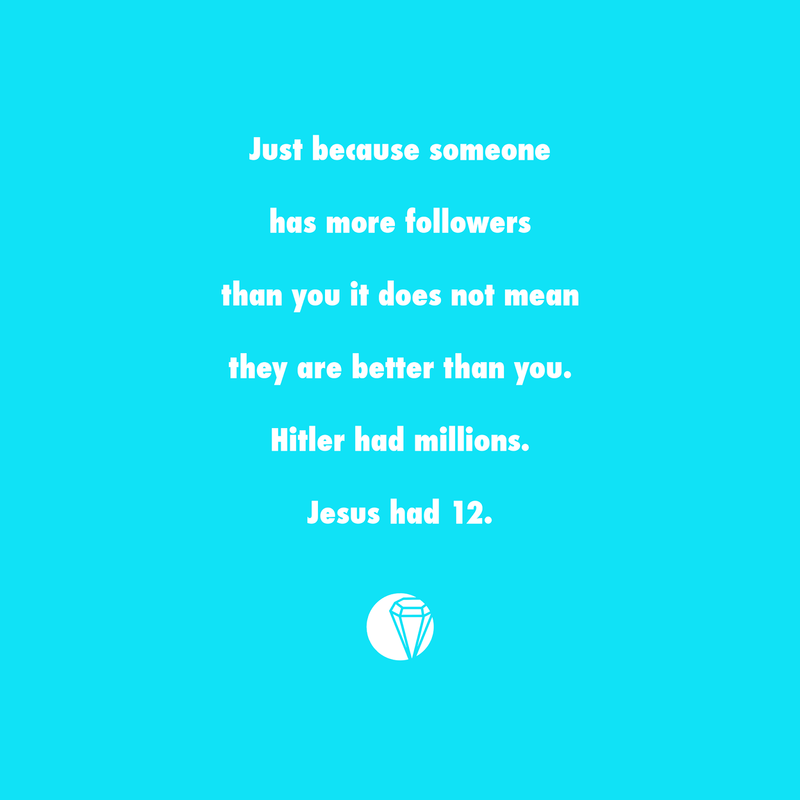 I am not comparing myself to Christ and those with lots of followers to Hitler. But I do think this is something we should consider. Today it seems so much of someones worth has been placed on a number. Their number of followers, the number of comments or “likes” on a photo, the number on a scale, the number in their bank account... We often look past the actual individual (even when it comes to ourselves) and base worth on fleeting and meaningless ideals. I might not have lots of followers. I might not be world famous. But I know I have helped change lives. One of those being my very own. That my friends, is success.